superdumb supervillain: See Kai Run for summer! See Kai Run for summer! 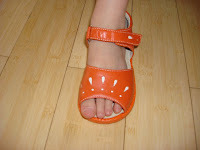 Roo received a pair of bright orange sandals from the ever-excellent See Kai Run. Her pasty toes don't quite do them justice yet, plus she's got about a half size to grow into them, but don't they just SCREAM summer to you? We are so ready for outdoor living. The style is called Raeden and they have been seen on quite a few notable babies (including the spawn of Tobey Maguire, as seen recently on Celebrity Baby Blog). Aside from their citrus-y chic, these sandals have also taught Roo something practical– she can now identify an exclamation point in any book we read!!! I'm also totally enchanted with the graceful silver stars on the Indria sandals. Boys can rock the classic Jackson sandals, which are also available in a blue variant. Or maybe your tiny metrosexual prefers a bolder look: the Jacob sandal might be right for him. Either gender would look sweet in the cherry red J'Cito. I love the contrast stitching. They would look adorable with nautical stripes! Click here to see the whole range of SKR sandals. Added bonus: you can now buy See Kai Run shoes online, direct from the source. Exclamation point.